The accessibility is one of the most important stuff for museums and often is replaced with “inclusion” because involves in holistic way all museum life in general. Thanks to digital accessibility the museums join the visitor’s technologies behaviours and improve the knowledge sharing on site and on the web with usable and responsive website and digital library. 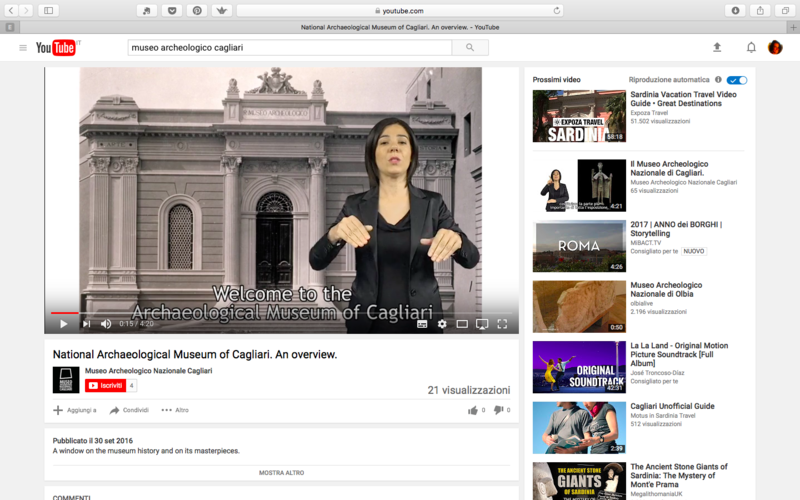 “Museo archeologico nazionale di Cagliari” liquid museum experience has its foundations in the awareness that the accessibility, in all forms, is a part of global museum strategy. What does it mean museum accessibility? For a long time the removal of physical barriers and the creation of separate sensory paths were considered the best solutions to make museums accessible. Nowadays, the means are different, and the main attention is also paid to learning and cognitive disabilities. The concept of accessibility comes in varying degrees and forms and it always more is replaced with term “inclusion”, because, the museum visit must be allowing everyone to access, as the same time, the available contents and information. The technologies play a fundamental role in building and improvement of museum accessibility, especially in terms of sustainability. Every single choice is integrated into a unique museum system, of which is recognized the holistic nature of strategy. communicates and exhibits the tangible and intangible heritage of humanity and its environment for the purposes of education, study and enjoyment.” This definition it was included in also in the Art Bonus Decree (Decree 83/2014). It is important to stress how museums are recognized as institutions at the service of society and its development. Therefore, museums are no longer cabinets of wonders, but places that have an active role in society, of which they are, in many ways, an expression. They play a key role for the cultural development and changing, able to change as the same time in order non-only to communicate but also to listen to people. Currently one of the main topics about museums is the public engagement and audience development. These are important goals, also for the role “service of society” that museums must have, but before any survey, project, changing the museum and all system that is necessary for define a museum as its, needs self-awareness and a kind of “evaluation therapy”. Museums must learn to know themselves, their staff skills, facilitating training staff to follow step by step museum transformations, economic sustainability. It is necessary stress in the planning strategic growth, in the build the business museum model, always looking at sustainability and, in special way for public museum, the accountability. Many good and visionary projects were often not sustainable and, above all, if you are talking about digital projects, with the consequence that museum and the warehouses are full of unworkable equipment, because the maintenance costs are too expensive or the technologies became old too soon. The Liquid Museum is the accessibility project of the National Archaeological Museum of Cagliari, arose in 2014 from the online consultation “Cultura senza ostacoli” promoted by Italian Ministry for Cultural Heritage and Tourism (Mibact). In this project, accessibility is curated in its physical, sensory, cognitive and digital aspects, and realized through training, workshops, the cooperation with local associations, as well as through the redesign of the exhibit and communication apparatus, the use of technologies for the information given and shared. The liquid term comes from Zygmunt Bauman theory, but it overcomes the negative meaning, the word ‘liquid’ does not mean ’fragile’ and ‘elusive’ instead it means ‘mobile’, as in ready to receive new content, new input, new output and new outcome. The technologies used are not fixed, but they ready to adapt and change following the digital transformation of society. The “liquid museum” is therefore accessible and dressed by visitor’s behaviours (young, old, disabled, migrant, online community) as it can assume different shapes to match the needs of every type of public. A museum must be liquid, that is to adapt to the needs of the visitor and society, to behaviours that change and which are often linked to liquid tools as technologies. It is also conscious that technologies became even more quickly obsoletes, for this reason it is necessary when is plan the digital strategy, and the museum strategy in general, pay the right importance to this topic. The museum is completely without structural barriers, news sofas and wheelchairs are bought, new distribution of objects in the showcases. There are realized 3D models in plastic material of some objects and they are exhibit in open box near the original finds, the visitors can take and touch during the visit. 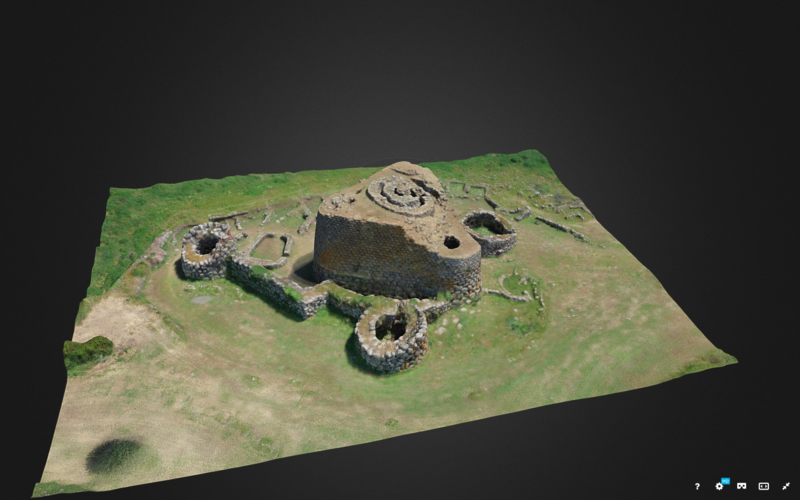 The object acquisition was by laser scan and photomodeling technologies, the Museum bought a 3D workstation and a portable laser scan and some of the 3D acquisitions were made, in collaboration with a CRS4 centre, by museum staff. Instead the reproductions were made thanks an agreement with Sardegna Ricerca , a regional research centre. Through a chance to touch some findings and / or their 3D models, made during staff training. There are also other touchable panels, one with pottery different forms, one with the map of most representative museum’s archaeological sites. In 2017, thanks another agreement with “Museo Tattile di Varese” was made a tactile wooden model of the archaeological site of Barumini, currently exhibited in the ground floor. The experience of being able to touch the exhibits or their reproductions is perhaps one of the most low-cost solution, however, almost simply, that makes the museum more accessible and friendly to visitors. A tactile panel with the map of the entire museum complex was also collocated outside the museum. The cognitive accessibility is aimed to give more understandable, readable, visible the exhibition Finds are re organization in the showcases, to make them see better for all target of visitors. Moreover, for panels, captures, using of the Sans Serif font, the right distance between text lines and an appropriately coloured background, was used a simplified but not trivialized writing, which helps explain the artefacts themselves, their use in ancient times and their role within the scenario that is set up in the exhibition. Therefore, communication must be understandable for children, teen agers, the elderly and families with children. The museum’s, in collaboration with local disabilities associations, realized a “social stories”  book of some of most representative museum objects. “Social Stories are a social learning tool that supports the safe and meaningful exchange of information between parents, professionals, and people with autism of all ages”. Along with the stories was also Roller banners was made with the rules of behaviour for children and adults in the museum. Liquid museum is a museum without barriers, a museum that seeks a dialogue with its visitors and with other agencies, are working collaborative arrangements to ensure that the project involves not only the entire City of Cagliari but also all Sardinia region. A dialogue extended to all Mediterranean Region. As a symbol of this cultural transition during century is the huge panel of “Tabula Peuntingeriana”, an illustrated ancient Roman road map, one of representation was freely use licence available on Commons repository. Accessibility its means also staff training, which goes hand in hand with other solutions. training must be an usual and common museum activity, aimed at improving the receiving visitors, at enhance the staff abilities, and train the staff to be autonomous using the different devices of updating information. In order to enhance the visitor reception was held a front-end and welcome course “Museo ComUNICA- comunicazione e relazione con il pubblico” of “Dipartimento di Pedagogia, Psicologia, Filosofia dell’Università di Cagliari”. The technologies are an important support in the achievement, management of data and information to the staff and professionals and in the communication and fruition to the public. The digital topic has been one of the most important in this experience. Were bought 50 small tablets as audio guide devices, a 55” multitouch table, an interactive whiteboard as a didactic tool, three monitors with video description in Italian sign language and subtitles. These multimedia displays are designed for are easily adaptable and renewable for new productions, new paths and new exhibition themes, and of course adaptable to include new findings and artefacts, because must be able to update its contents without losing its accessibility. The multi-touch table are designed three main areas: Explore, as an introduction for the visitors with 3D landscapes reconstruction and virtual tour, the second is Know, for who wants to deepen more about Museum objects and archaeological sites, and the third is Play dedicated to didactic activities. The Museum bought a 3D workstation and a table laser scan and all model are acquired and processing by those machines. The study carried out by the European project LEM  on case studies shows that multimedia must be well-built, with attention not only to the quality of the content posted (texts, images) but also to the usability of these instruments and their playful aspect. The digital accessibility of the Liquid Museum is also on the web, with the setting up of a digital strategy on social networks, with the creation of the website and Digital Library . The website was created using CMS WordPress and following the guidelines provided by Agenzia Italiana per il Digitale (AGID)  . The site is designed to be graphically new, with a unique visual identity, easy to navigate, with texts and graphics related with published content. 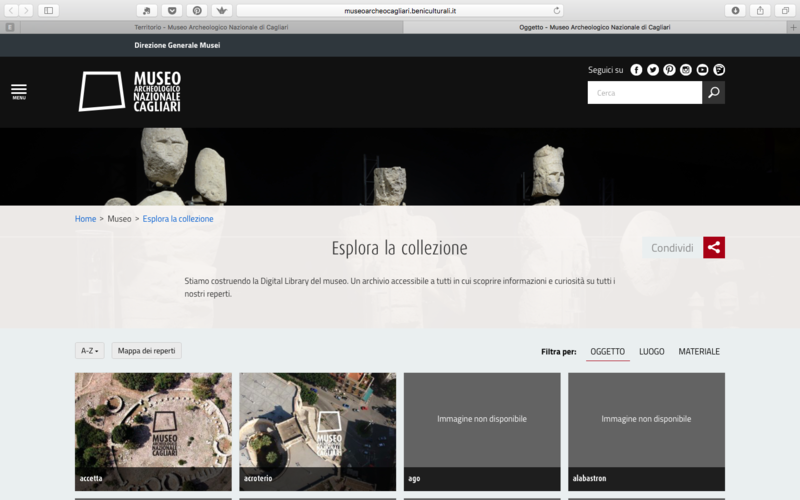 The web strategy was built using the monitoring schema  created by the research team Digital Cultural Heritage of ICOM Italia in collaboration with Direzione Generale Musei of Mibact. The main and most innovative parts of the website are the area dedicated to the territory and the Digital Library and the Open Data. In the territory section, an interactive map based on the OpenStreetMap , which represents the locations of the exhibits exhibited, a window on the important territory to give a geographical context to objects has been developed. The objects are then linked to the Digital Library of the Museum, which has been chosen to build directly using WordPress, because was easier and the database contains 4000 records. Aimed to simply the user experience the object exploration has been simplified, the main search filters are three “Object, Material and Place” designed by keys research topics. To favourite the knowledge dissemination and sharing the open data of the collections was released in a dedicated section. This is one of the first cases in which an Italian state museum makes available data on its collections in open data. The data is available in downloadable csv format. The Museum website is the is thought to be the centre of online digital identity of the museum around which the various social profiles are linked. The Sketchfab  account is the one that allows you to bring 3D reconstructions realized for internal media even outside the museum, allowing the visitor to access remotely. Liquid museum experience goal is make accessible the museum, this accessibility has been split up and dealt with in all the complexity of its definition, and in all its forms (physical, sensory, cognitive) and in all its manifestations (e.g. use of technology, communication, training) and then meet again to share and to involve in its development and movement its users-visitors. Nowadays the importance of technology in cultural enjoyment is acknowledged and generally accepted, and our museums use many different apps. Technology is more and more present in museums, helping to develop new ways to enhance the enjoyment of the visit, providing means that are inclusive, like 3D, immersive technologies, augmented reality, video reconstructions and simulations. Technology is changing the way we think about museums  and changing the relationship between the public and a museum objects. A critical issue, however, is the lack of sustainability of some of these instruments and how difficult it is to keep up with the fast evolution of technology. Unfortunately, even the most innovative, newest app becomes obsolete in a very short time, and visitors, who are very often conscious consumers of hi-tech software and devices, are left bored while museums are filled with old equipment and/or computer screens that are no longer useful. Levent N, Knight, H, Chan S, and Lonzano Hammer R (2014), Tecnology, senses, and the future of museums, In The multisensory museum, Cross-Disciplinary Perspectives on Touch, Sound, Smell, Memory, and Space, edited by Levent N and Pascual Leone A., Rowman & Littlefield, pp.341-348.